Call it the case of the disappearing dealers. Last summer on 1stdibs, the names of vendors, which once appeared next to each of their listings, began to be removed. Now they're all gone. When potential buyers see a sofa or a side table they like, they don't know who the seller is until they begin a conversation via the 1stdibs website. It's not exactly a whodunit, though—1stdibs notified its clients of the switch in an October email. The question from the many merchants and designers who are unhappy is: Will this rule change be a game changer for the online design and antiques marketplace? "I hate it," said Paul Donzella, who owns a design store in New York. "I've been in this business for 25 years and my name means something." 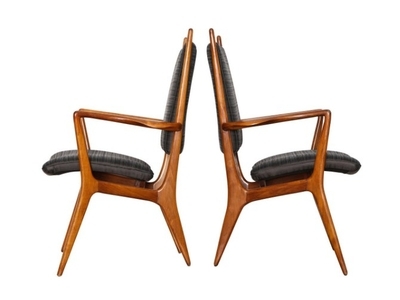 A pair of Vladimir Kagan armchairs for sale by Paul Donzella on 1stdibs. Courtesy of Donzella. For 1stdibs, which dominates the marketplace but which concedes that it is not yet profitable, the move was about getting even bigger. "We want to meet the market where the buyers are," said Cristina Miller, 1stdibs' senior vice president of dealer relations. "We are seeing that people are more and more comfortable buying $50,000, $100,000, and even $150,000 items online." Most of them, she said, "have never heard of a dealer's name." Founded in 2001 as a listings site that charged dealers a set monthly fee plus a per-item listing charge, 1stdibs has long been moving in this direction. Like any internet-based company, it is constantly experimenting and evolving. It introduced a purchase button in 2013. In 2015, when it launched its mobile app, it left out sellers' names. And it morphed completely into an e-commerce platform where transactions take place—like Amazon—in 2016 when it dropped the listing fees that brought in $10 million in revenues a year. Instead, the company charges a commission of up to 15 percent of each sale, plus a three percent transaction fee for credit card use, along with the monthly fee. But since then, too many inquiries, apparently, began online and then moved offline to make a deal—cutting out 1stdibs. Pushing dealers' names deep into the site's communications channel removes that possibility. Dealer and designer grumbling is particularly loud among those who peddle and buy high-end or unique goods. "With some other dealers, a piece might turn out to be junk," says Donzella. "By removing our names, you remove the ability of clients to know which is which. It makes me wonder whether my long-term goals are aligned with those of 1stdibs." Says designer Lilly Bunn, "I love what 1stdibs does, but I want to be able to talk with dealers." She might, for example, ask a dealer to make a video of the piece, perhaps with someone walking around it. Or she might request an extra protective layer in the shipping. Now that would happen in emails through 1stdibs. "It's an extra process to get the information you need," she protests. Designer Brad Ford also complains that "this makes it more difficult for me to do my day-to-day work." If he is searching for a specific item, he might get 100 results. In the past, he probably would go directly to the dealers he knows and trusts. Now he has to email each one to find out who the seller is. "It makes me question my loyalty to 1stdibs," he says. That leveling of the playing field appeals to some dealers, however—especially those outside design centers like New York, who appreciate the global marketplace 1stdibs has created. Ed Koren, owner of Bridges Over Time in Palm Springs, cited recent sales to clients in Australia and South Korea whom he would never have reached in the past. Jimmy Lam, the owner of Antique Textiles Galleries, which was once located on Madison Avenue in New York but is now in Fort Lauderdale, says he has increased his worldwide presence, too. He does about 50 percent of his business through 1stdibs. So far the griping has remained just that. Since the October surprise, 1stdibs has lost only 4 of more than 3,000 dealers because of the change, the company says. In 2016, after the move to a transaction site, about two percent of dealers chose to leave, but "several" have since rejoined. John Smiroldo, founder of rival InCollect, is trying to take advantage. In a November 6 email to "friends and colleagues," he described 1stdibs' move (without mentioning its name) and wrote "I encourage you to spend time using InCollect and compare us to other platforms. We invite dealers to apply for membership and interior designers and architects to join our In The Trade program." After sending the email, he received 47 applications to join InCollect in one week (he accepted 11). Before this move by 1stdibs, he might get three a week, more or less. But InCollect, with much lower sales volume, poses little threat just yet. Koren says that he has listed on InCollect since August 2014, but has not made a single sale through it. 1stdibs claims to have 15 to 30 times the listings of its nearest competitors. The company also reports that $200 million worth of goods will have been sold on the site by the end of this year, up 40 percent over 2016. Dealer Jill Fenichell sees no online alternative. She explained her decision to leave 1stdibs in a November post on Facebook, saying: "Only two months out of 24 have been profitable. Also, I have the right to run my business as I see fit. I will lose sale frequency, but what sales I do make are bound to be more profitable." Reached by phone, she expanded, "1stdibs has not helped me sell at the high end, and I don't need help selling things under $500." But, she added, "I don't think at the moment there's a replacement for 1stdibs."